The leaders of Colombia, Argentina, Brazil and Panama met with US President Donald Trump in New York on Monday. They discussed a very important question: what to do with Venezuela. The problem is that the regime of President Nicholas Maduro, the left populist, who has excellent relations with Russia and China, does not fit into the scheme of servicing relations between most Latin American countries and Washington. "We are all worried about what is happening in Venezuela, we want to protect the Venezuelan people so that democracy is restored. We discussed the need and form of coordination between the countries to promote a peaceful democratic transition (of power) while maintaining stability, "Tass quoted Colombian President Juan Manuel Santos. Taking into account the fact that the country is considered the world's largest producer of cocaine, and its production and exports rose sharply after the peace between the Colombian government and the leftist insurgents, "no concrete measures were worked out" at the talks with Trump. However, they adopted a framework decision to "work in a team, share with others their opinions" in the name of the declared goal. Also, Colombia is more interested than other states in resolving successfully the situation in the neighboring country. Santos stressed that "it is very important that this happens peacefully and democratically." He "told President Trump once again that any military intervention would not have the support of Latin America." Here, the Colombian president did not dissemble: Venezuela has a very strong army, which is in a difficult situation, and the peoples of the two countries speaking the same language have friendly feelings towards each other. Therefore, using force and army todislodge the regime in a neighboring country, the UScan provoke a particularly negative reaction among the people of Colombia. The US have proclaimed "American order" using methods of coup d'état or even the Marine Corps in Latin America hundreds of times, so it looks like something so natural for the countries of the region. The negotiations were also attended by the Presidents of Argentina - Mauricio Macri, Brazil - Michel Temer and Panama - Juan Carlos Varela. Apparently, this will be the core of the anti-Venezuelan alliance prepared by Washington. Panama is almost a pocket state for the US, and Brazil and Argentina are the economically most important countries in South America. And they are now ruled by representatives of the pro-American elite. They will probably have a key role in working with the United States to try to bring Venezuela, which is paying its debts with great difficulty , to a default. For several years, despite the shortage of food, essential goods and medicines, it has been trying to pay all its debts to creditors. Otherwise they will arrest Venezuelan assets, especially oil supplies, which bring currency for the country. And this is the end. Caracas’s two main allies are Russia and China, which are trying to help President Nicholas Maduro, while not encouraging him to violate the constitution even for the sake of good purposes. Cuba is a close neighbor, but it does not have extra money. But the Latin American enemies and the US, which considers Latin America its patrimony, are surrounding the country with a dense ring. It seems that the opponents of Caracas do not need to overthrow the Venezuelan regime by armed means. It is necessary only to increase methodically pressure on it and create constantly new difficulties for the people of Venezuela according to the scheme that was used in Chile to overthrow the popular President Salvador Allende in 1973. And it is happening now. The US Treasury Department is constantly expanding sanctions against Venezuelan officials. Washington is trying to undermine the financial and economic system of the country. Thus, in August, Trump signed a decree imposing financial sanctions on Venezuela: US companies are banned from dealing with new debt and securities issued by the government and the state oil company Petroleos de Venezuela (PDVSA) with maturities of more than 30 days and 90 days respectively. Since oil revenues are about 95% of financial revenues from Venezuela's total exports, this is very serious. But it is even difficult to imagine what will happen if the United States, the traditional client of Venezuela in this sphere, refuses oil purchases, which Venezuelan authorities demand to produce not for dollars in order to avoid sanctions restrictions. It is unlikely that the United States will continue to buy Venezuelan oil for a long time, the price of which has been already determined in yuan for several days. 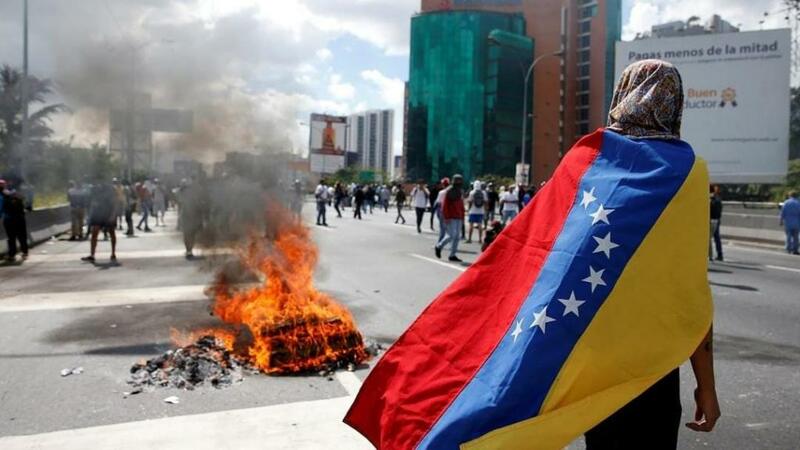 Venezuela's problems do not differ so much from the problems of other Latin American countries, whose economies are deformed because of the age-old dependence on the United States. But if elite groups that are closely related to America are the main beneficiaries of this system in most of these countries, then in Venezuela, people began receiving the benefits of the country's natural resources under the regime of Hugo Chavez. However, a sharp drop in oil prices and economic and financial intrigues of Washington put Venezuela's unique system of redistribution of public goods under attack - the benefits have become much less for those who are accustomed to rely on them. As a result, a political crisis arose in the country, opponents and supporters of the regime began clashing, the level of crime jumped, pro-American opposition associated with elitist and comprador circles became stronger. Well, the lumpen, after all, does not care who to claim for handouts: if the Maduro regime has depleted them, let it down, let those who promise to get out of the crisis come to power. Since oil prices, according to experts, are unlikely to change in the foreseeable future, and there is no other income for Venezuela, and everything will depend on the degree of determination of the external and internal enemies of the ruling regime to put an end to it. Obviously, Washington and its allies will not leave Venezuela alone in any case. The United States itself actually suffered for a while in the Latin America because it never doubted its ability to put "order" there when it was needed. It seems that after Washingtonremoved successfully independent President Dilma Rousseff from Brazil and replaced her with itsprotege by means of intrigues, the time has come for another country and another president . And despite close ties with Venezuela in the energy and military fields, Russia will be very difficult to help him.